If you add $159.88, $768.26, and $120… it adds up to $1048.14, not $888.26. I used all the same values as previous, only made the hourly rate $15/hr, because none of us should be creating for less than that. 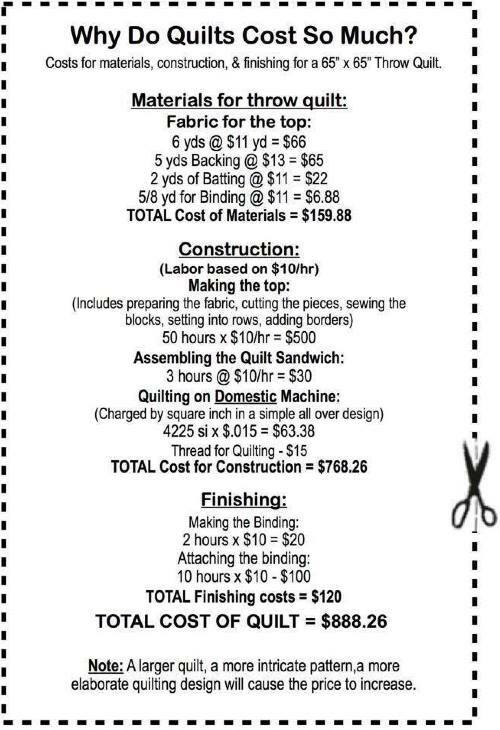 I kept the $11/yard of fabric, even though some fabric is more expensive… this seemed to be a good average cost. I tried to make it easier to read and added a bit about added cost of education, maintenance, and utilities too. For an example, on my last quilt, I kept track of all my time and I spent over 91 hours on it and over 9 yards of fabric for the top. Even more time is spent because sometimes I piece my backs too… and this doesn’t touch time for design, layout and fabric choices. I do what I do because I’m driven to it as a creative expression, definitely not for the money! A quilt will always be a treasure to its’ maker. I made another chart based off my Manipura quilt where I kept track of time to the minute. 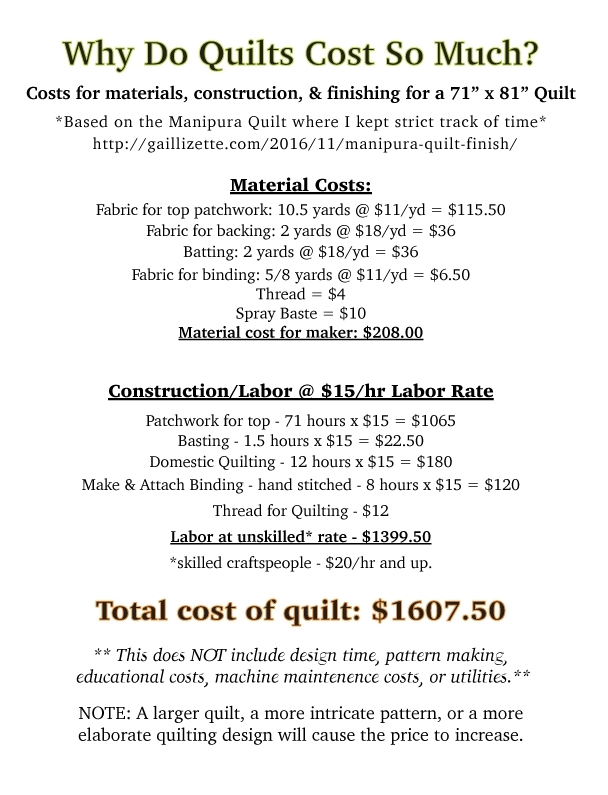 Labor at $15/hr doesn’t account for any taxes or fringe benefits either… which you would be earning if in the labor force (SS and Medicare tax pdx by employers) and taxes paid by the earner would be passed on to a purchaser of a quilt too… assuming anyone could afford it of course! Very true! 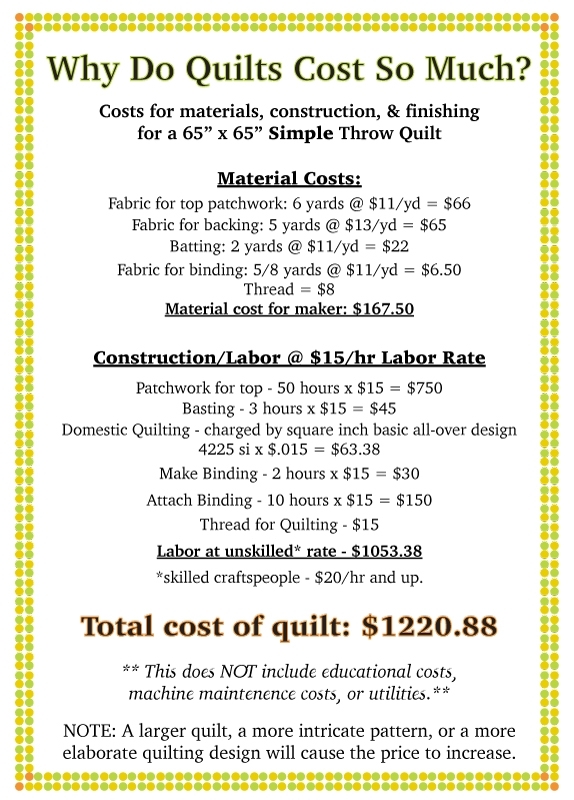 It’s why I can’t really make money quilting, but they sure make great gifts! It appears the original math is not wrong. The $768 number is a subtotal of the materials and construction. Labeling could have been better. But doesn’t include the “finishing” costs. So she was correct.